The great-great-great granddaughter of an enslaved man named Renty has filed a lawsuit against Harvard University, alleging that the institution repeatedly ignored requests to stop licensing pictures of her ancestors for the university’s profit, and stop misrepresenting her great-great-great grandfather. 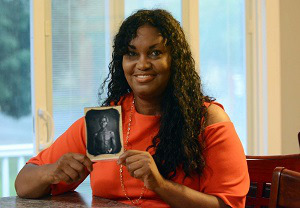 Tamara Lanier, holding an image of her great-great-great grandfather, Papa Renty. Tamara Lanier’s lawsuit, filed Wednesday in Middlesex County Superior Court, seeks damages from Harvard, validation of her lineage and the return of the 169-year old daguerreotypes of the man she knew through family stories as “Papa Renty” and his daughter Delia. Commissioned in 1850 by the controversial Harvard professor Louis Agassiz, the images depict Lanier’s enslaved ancestors naked and from various angles. The daguerreotypes – used by Agassiz to support racist theories of African and African-American inferiority – are currently housed in the Peabody Museum of Archeology and Ethnography at Harvard. Lanier’s lawsuit alleges that after the long-forgotten daguerreotypes of Renty and Delia were found in 1976, Harvard made no effort to identify their descendants. It alleges that Harvard has continued to profit from her ancestor’s images, pointing to a recent example in 2017 where the university used Renty’s image on the cover of the 13th anniversary edition of From Site to Sight: Anthropology, Photography and the Power of Imagery, which sells for $40. During a press conference Wednesday, civil rights attorney Benjamin Crump, co-lead counsel for Lanier, said Lanier’s efforts to trace her family history is “nothing short of miraculous,” given that many Black Americans cannot trace their lineage because of slavery. “For 169 years, Renty has been enslaved, bound by Harvard,” Crump said. “This lawsuit demands that Harvard set Renty free. At the end of day, all they’re doing is condoning slavery by denying Renty’s lineal descendants the right to the only thing that a Black person could own when Lincoln freed us” – their image and personhood. “Harvard, you’re better than this,” Crump said. Lanier’s lawsuit lists the president and fellows of Harvard College, the Harvard Board of Overseers, Harvard University and the Peabody Museum of Archeology and Ethnology as defendants in the suit. A Harvard representative declined to comment because the university had not yet been served with the lawsuit. Harvard is among a host of higher education institutions reckoning with their past ties to slavery and racial injustices. In 2016 under the leadership of former president Dr. Drew Gilpin Faust, the university convened a faculty committee to guide university efforts related to scholarship and research about Harvard’s history of slavery. The institution is also a part of the Universities Studying Slavery initiative. Crump said that without slavery, the images of Papa Renty and Delia would not exist.